An unidentified 12-year-old girl suffered a severe neck injury while on an overnight school trip in Texas in April 2016. 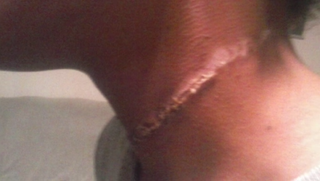 A Texas mother is furious that her 12-year-old daughter returned home from an overnight school trip with a severe rope burn around her neck, the Dallas Morning News reports, and has taken her child out of school. According to the report, the girl, who is black, attended the mostly white Live Oak Classical School, a private institution in Waco, Texas. The unidentified girl and her mother reportedly believe that the April incident school officials are saying is an accident was, in fact, a racially motivated attack, the culmination of months of bullying at the hands of classmates. “It looked like somebody had ripped her neck apart and stitched it back together,” Sandy Rougely, the girl’s mother, told the Morning News. Live Oak maintained in a statement that the injury was “caused accidentally” while the students, eight girls and 14 boys, were playing with a rope swing attached to a tree. The girl was reportedly one of two black students on the trip. In the statement, Counsellor added that the girl’s attorney, Levi McCathern, was looking to “exploit” the 100th anniversary “of the lynching of Jesse Washington in Waco” by demanding that the school pay out $2.7 million or else he would make the allegations public. “The lawyer claimed that the student’s injuries were racially motivated, intentional attack. Live Oak takes this accusation seriously. The school interviewed all student eyewitnesses and teachers who were present and each independently established that the accusation made by the attorney is absolutely false. The injuries were caused accidentally while the students were playing with the swing and attached pull rope. The attorney was advised of the results of the interviews,” the statement continued. McCathern countered by saying that the child’s legal team asked for financial compensation only after the school requested such a demand in writing. Attorney T.J. Jones added that they factored in living expenses, plus private school through the 12th grade, college for the girl, and her plans to pursue a law or medical degree. Furthermore, it was noted, chaperones never notified the child’s mother about the injury, and none of the adults were watching the children as they played on the swing, so they did not see the incident. One parent on the trip, a doctor, reportedly examined the child’s neck before covering it with Vaseline and giving the girl ibuprofen, the girl said. “I don’t know how you can look at her neck, at the pictures and think this was anything but intentional,” Jones added. According to the girl, she was helping to swing the other kids before stopping to watch. The next thing she felt was the rope going around her neck from behind before it pulled against her neck. The girl said that she fell to the ground and was tugged backward. None of the students helped her, the girl added, and so she removed the rope, only to find small pieces embedded in her neck. When she looked back, the girl said that she saw three boys, all of them white, who she claimed had been bullying her before. “Guys, did you do that on purpose?” the girl said she asked the trio. “‘No. Why would we do that on purpose?’” she said one of the boys answered. But the girl said that she doesn’t understand how the accident occurred because previously when the kids let go of the rope, it just fell to the ground. The 12-year-old is reportedly finishing her schoolwork for the rest of the school year at home.